In an exclusive interview, the 12 boys and their soccer coach thank the world. Sitting on an ornate carpet in a Thailand temple on Wednesday, a golden Buddha staring over their shoulders, the 12 young soccer players and their coach beamed with smiles and spoke of the uncertainty they faced while trapped in a flooded jungle cave — and the lessons they learned. In an exclusive interview with ABC News, the members of the Wild Boars soccer team reunited, eager to thank the world for the outpouring of love and support that went into rescuing them from a harrowing subterranean ordeal — many details of which they shared publicly for the first time. "We learned about love by receiving love from everyone," said one of the boys, Adul Samon, 14. Watch the full interview with the rescued Thai boys and their soccer coach on "World News Tonight" at 6:30 p.m. (ET) and the full interview on ABC News Live on Thursday evening; on "Nightline" at 12:35 a.m. Friday, and on "20/20" at 10 p.m. Saturday night. The boys, sporting buzz cuts and wearing yellow shirts, sat with their coach, Eakapol "Ek" Jantawong, 25, who was wearing a saffron monk's tunic, at the Wat Phra Doi Wao Temple in Mae Sai, Thailand. "I would like to thank everybody. You all love me and I love everyone," said Adul. "I feel like people around the world are my parents." ABC News arranged an interview with the Wild Boars through the Thai government, on the condition that the topics be reviewed by child psychologists and other specialists caring for the team in order to protect the young boys’ well-being. Following their dramatic rescue in July, the boys and Ek spent several days at the temple studying with Buddhist monks and learning all the things that would have been of great help to them while they were marooned in the Tham Luang Nang Non cave in northern Thailand for nearly two weeks. Asked what they took away from their time at the temple, the boys rattled off a list. One boy said they learned "how to be patient." Another boy said he was taught "to have a very peaceful mind." The youngsters said they have all been enjoying being back in school and with their families. They have also been trying to adjust to their newfound fame, getting stopped on the streets by admirers wanting to snap photos with them. One boy, Duangphet "Dom" Phromthep, 13, said his followers on Instagram have grown to more than 300,000. Following soccer practice on June 23, Coach Ek led the boys into the cave for a post-practice adventure. The coach and two of the 12 boys had previously visited the cave and piqued the others' interests by telling them of its various chambers, one they referred to as "the hidden city," and another they forebodingly called "the underwater city." "At first I was excited that I was going [to the cave] and have an adventure," said Somphong Jaiwong, 13, nicknamed "Pong." The youngest of the group, 11-year-old Chanin "Titan" Viboonrungruang added, "At the beginning, it was exciting. And it's a little bit frightening." Coach Ek said they had all discussed going to the cave beforehand and he brought along supplies he anticipated they would need: A flashlight, spare batteries, and a rope. They had only planned to stay for about an hour, so they brought no food or extra clothing. As the group explored the underground, monsoon rains hit. Coach Ek said that as they started to exit the cave, they found their path out was flooded. (Asaf Zmirly) Divers work on a plan to rescue 12 boys and their soccer coach who remain trapped inside the Tham Luang Nang Non cave, Chiang Rai province, Thailand. "When we went in and got stuck in the cave, at that moment, we saw water. It's full of water," the coach said. "I then volunteered to dive to find out if I could go through or not. If I could go through then everybody is saved. So, we used the rope that we brought with us." He said he held onto one end of the rope and asked three of the boys to hold the other end, and gave them specific instructions on what to do if he ran into trouble. "I told the boys that if I signaled by pulling the rope twice, it means pulling me back because there was not enough oxygen," he said. Soon after diving into the flooded passage, Coach Ek realized he couldn't make it through, and the boys pulled him back. The coach said he immediately realized that he had to keep the boys calm and hopeful. "From the beginning that I knew that we were stuck in the cave, I first tried to regain my composure," he said. "I tried not to tell the boys that we got stuck in the cave. I only told them something positive. I told the boys that we just had to wait for a bit longer, then the water may go down and we could get out. I tried not to make them panic. If I told them that we got stuck in the cave, the boys would get panicked." 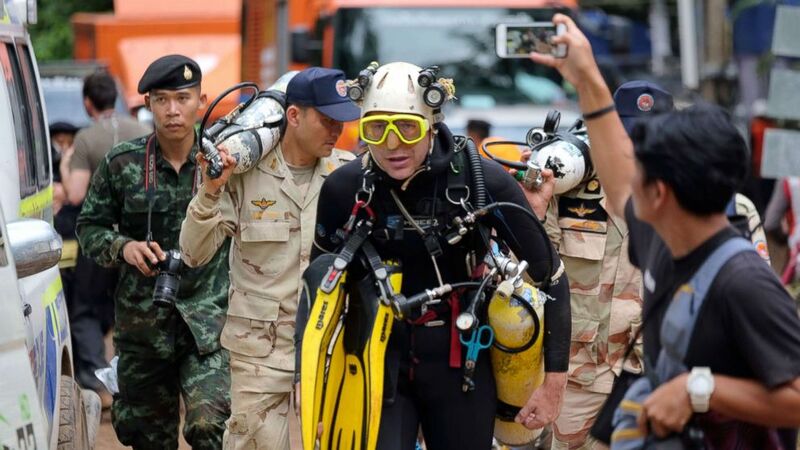 (Linh Pham/Getty Images) British cave-diver John Volanthen walks out from Tham Luang Nang Non cave in full kit without any response to reporter's questions, June 28, 2018, in Chiang Rai, Thailand. But as the hours ticked away and the flood waters grew, Coach Ek turned to prayer as the group headed deeper in the cave in search of dry ground. "Praying has become more like my own habit," he said. "It's standard when these boys are staying at my house. Before bed, I invite them to pray. This gives us good sleep, and stops us thinking about other things." Coach Ek's habit quickly rubbed off on some of the boys, including Phonchai "Tee" Khamluang, 16. "I believe that meditation and praying are good things to do," Tee said. As the hours turned into days, and then a week, the group drank fresh water dripping from one of the cave's stalactites, and kept up hope by taking turns digging with rocks in the cave's walls. Their mantra became "su su" -- Thai for "keep fighting." Ten days after they entered the cave, the group was sitting on a small beach inside a chamber. Some of them were getting weak from a lack of food. They heard splashing in the water below and a voice speaking English. (Royal Thai Navy via AP) Thai rescue team members walk inside a cave where 12 boys and their soccer coach have been trapped since June 23, in Mae Sai, Chiang Rai province, northern Thailand in this undated photo released by Royal Thai Navy, July 7, 2018. On July 2, two divers from the British Cave Rescue Council, John Volanthen and Richard Stanton, were stringing a safety rope through a flooded area of the cave when they popped up in a cavern and, to their surprise, saw all 12 boys and their coach huddled on a small beach in the darkness. Adul, one of few boys who speaks a little English, was sent to the water's edge to find out who they were. "I was shocked. I was overwhelmed and didn't know what to say. I was happy," Adul said. Prior to that moment, he said the group wasn't sure if anyone had been searching for them, let alone realized that more than 3,000 rescuers from around the world mobilized to find them. Over the course of eight days, a plan to rescue the boys by bringing them out one by one with divers was developed. 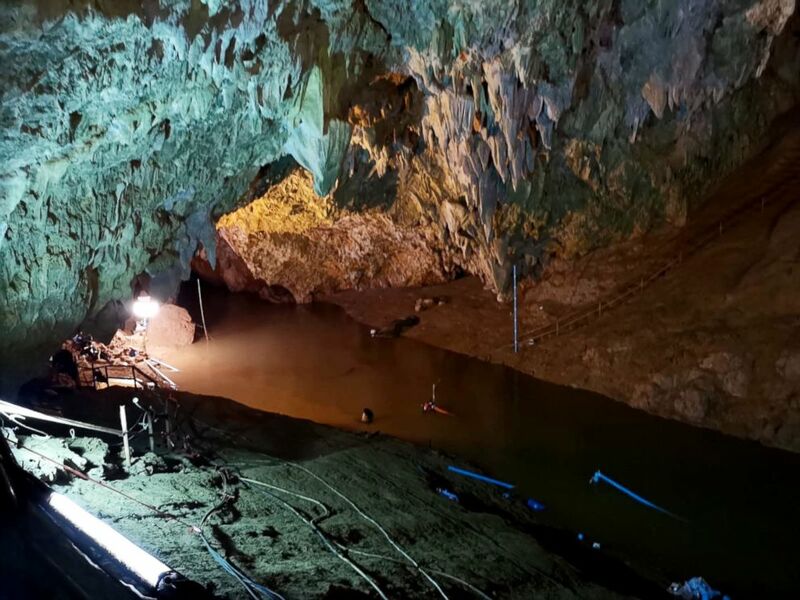 As the final details were being hatched, one volunteer diver, retired Thai Navy SEAL Saman Gunan, lost consciousness during an overnight operation delivering extra air tanks inside the cave. He could not be revived and was confirmed dead on July 6. Rescue operations to pull the boys out of the cave began July 7. 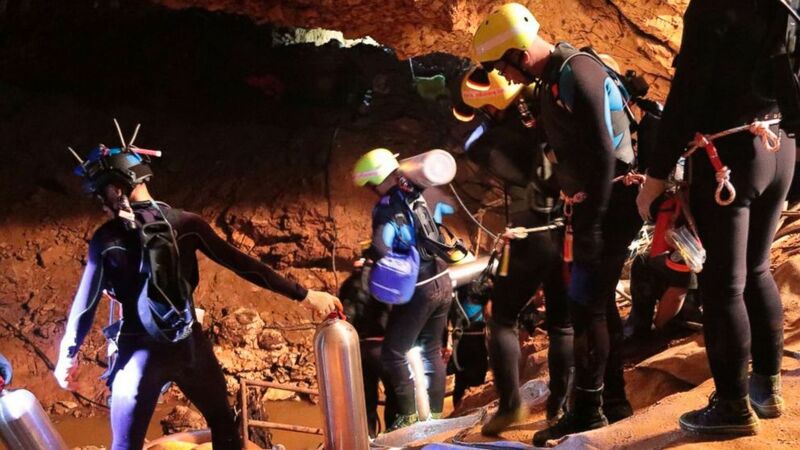 After three days of rescue efforts, on July 10, divers managed to safely extract all of the boys and their coach from the cave, ending the drama that by then had people around the world clamoring for any word on the mission and hoping for the best outcome. Titan said he broke down in tears when he first saw his parents through a glass partition at the Chiangrai Prachanukroh Hospital, where the boys and their coach were quarantined and treated for several days. "I was very happy to see my dad and my mom. I feel warmer," Titan said. "I was very happy. I cried." The boys each said they are looking to the future, and their experience in the cave has motivated them to be productive, positive citizens. "I want to be a mechanic, to fix cars," said Mongkhon "Mark" Boonpiam, 13. "I want to be a Navy SEAL," said Ekkarat "Biw" Wongsukchan, 14. (Soe Zeya Tun/Reuters) The 12 boys and their soccer coach who were rescued from a flooded cave arrive for a news conference in the northern province of Chiang Rai, Thailand, July 18, 2018. "I want to be an architect," said Natthawut "Tle" Thakhamsong, 14. Most of the boys said they want to grow up to represent their country on the national soccer team. "I want to play soccer. I want to be like [professional soccer players Cristiano] Ronaldo and [Lionel] Messi," said Adul. Several of the boys also made a point to thank His Majesty King Maha Vajiralongkorn of Thailand. Coach Ek wrapped up the interview by telling ABC News how thankful they all are to be alive. "I would like to express my gratitude for people from the whole world, officials, and volunteers that came to help us," he said. "We promise that we will be good citizens to society. We will study, and we will love people around the world the same way the whole world loves the 13 of us. Thank you."